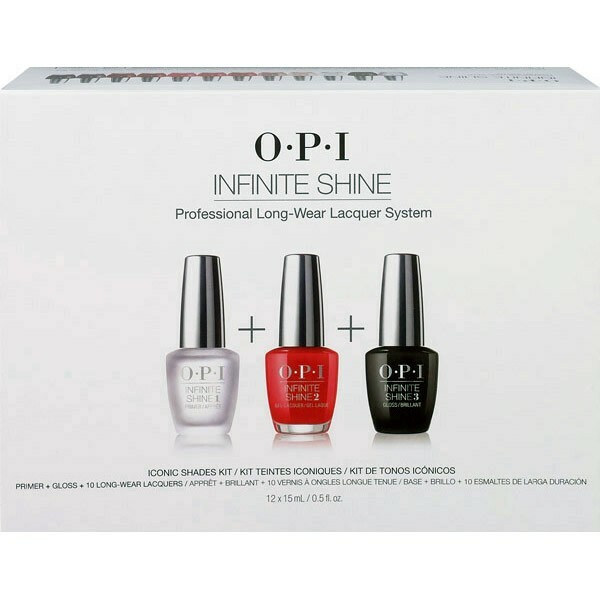 “Iconic Shades Kit” contains: 1 x OPI Infinite Shine ProStay Primer 15ml, 1 x OPI Infinite Shine ProStay Gloss 15ml, 1 x OPI Infinite Shine Nail Lacquer in the shade “The Thrill Of Brazil” 15ml, 1 x OPI Infinite Shine Nail Lacquer in the shade “An Affair In Red Square” 15ml, 1 x OPI Infinite Shine Nail Lacquer in the shade “Got The Blues For Red” 15ml, 1 x OPI Infinite Shine Nail Lacquer in the shade “Bogotá Blackberry” 15ml, 1 x OPI Infinite Shine Nail Lacquer in the shade “Vampsterdam” 15ml, 1 x OPI Infinite Shine Nail Lacquer in the shade “Tickle My France-y” 15ml, 1 x OPI Infinite Shine Nail Lacquer in the shade “You Don’t Know Jacques!” 15ml, 1 x OPI Infinite Shine Nail Lacquer in the shade “Miami Beet” 15ml, 1 x OPI Infinite Shine Nail Lacquer in the shade “The Latest and Slatest” 15ml & 1 x OPI Infinite Shine Nail Lacquer in the shade “Suzi-The First Lady Of Nails 15ml. 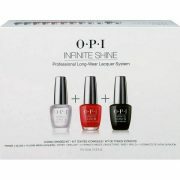 OPI Infinite Shine Professional Long-Wear Gel Effects Lacquer System. 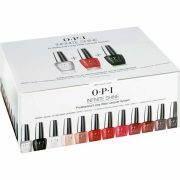 This “Iconic Shades Kit” includes Primer + Gloss + 10 long-wear lacquers. Prime – Apply one coat of the advanced “Primer” for real staying power and stain-free removal. 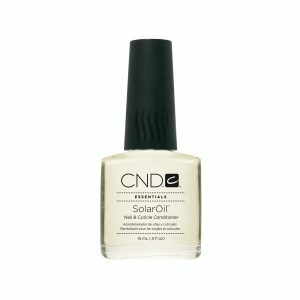 Long-Wear Lacquer – Apply two coats of Infinite Shine colour. 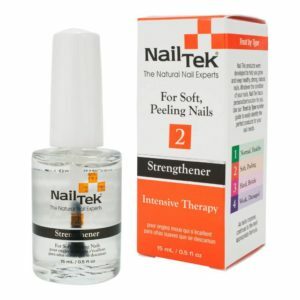 Wait two minutes after second “Lacquer” coat to apply “Gloss Top Coat”. 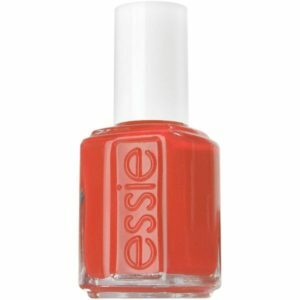 Gloss – Finish with one coat of “Gloss” for a durable finish that cures to a mirror shine in natural light.